When it comes to sleep, the rule of thumb is pretty simple: get eight hours of it per night on a regular basis or you start to go ‘loopy’. So how do PepsiCo’s Indra Nooyi, Twitter’s Jack Dorsey and HuffPo’s Arianna Huffington get by on four? Well… they don’t. In 2007, Huffington collapsed due to sleep deprivation and then, like any good media mogul, she wrote the book on it. Unlike other successful CEOs (Huffington sold her news site to AOL in 2011 for $315 million) sleep is now at the top of her To Do list. With Apple’s iOS 10 offering a new Bedtime feature, and a growing range of apps and wearables aimed to assist sleep and improve wellbeing, now’s the time for a sleep renaissance! You’ve probably heard of the circadian rhythm: the internal body clock that naturally syncs and adjusts to your external environment. As we move through the day and night, our rhythm dips and peaks at different times. The fatigue during the dips is less intense if we’re getting a good night’s sleep, and more intense if we’re not. It doesn’t take a neuroscientist to see that sleep makes for a more alert, productive human. Sleep helps clear toxic byproducts from our brains, aids in memory formation, and it allows our bodies to release growth hormones, which helps muscles repair, bones grow and the regulation of body fluids. Sleep also allows the body to metabolise sugars and fats. On the flip side, sleep deprivation can suppress our immune systems, increase blood pressure, and lead to obesity, not to mention downgrade emotional intelligence and alertness. Lack of sleep lifts cortisol levels: the stress hormone that activates reward centres in the brain and makes us want food. Sleeplessness messes with our ability to use insulin, making it harder for cells to remove fatty acids and lipids from the blood stream. Our current ‘always on’ culture is bad news for our bodies. Dr. Charles Czeisler, the Baldino Professor of Sleep Medicine at Harvard Medical School, calls it downright dangerous. Being ‘on’ around the clock, according to Czeisler, induces a level of impairment every bit as risky as intoxication. People who average four hours of sleep a night for five consecutive days develop the same level of cognitive impairment as if they’d been awake for 24 hours – equivalent to legal drunkenness. However, as the conversations around the importance of sleep grow, employers are starting to take note. In the US, workers at insurance provider Aetna now earn $25 for every 20 nights they get over seven hours sleep; it’s part of the company’s ‘sleep program’. According to a 2015 consumer mobility report, 71% of Americans sleep next to their smartphones. In Australia, 72% of us use phones within an hour of sleeping (excluding setting an alarm.) This sounds like bad sleep practice, unless your smartphone is helping you snooze. Enter sleep apps: programs that track your shut-eye, and build data to help you understand what triggers a good, and bad, night’s rest. Tried and tested options include Sleepbot, which is free and widely considered one of the best sleep apps (the US National Institute of Health even gave it a nod). It’s packed with features to track sleep patterns, which include monitoring motion and listening to night noises (snoring and talking); it’ll also nudge you awake during a phase of lighter rest. Sleepbot captures and files data over six months, and displays it via interactive graphs. This is great if you want to understand your shorter-term sleep patterns, but those looking for longer data sets (which is where sleep apps can really be helpful) will need to back up the info online. 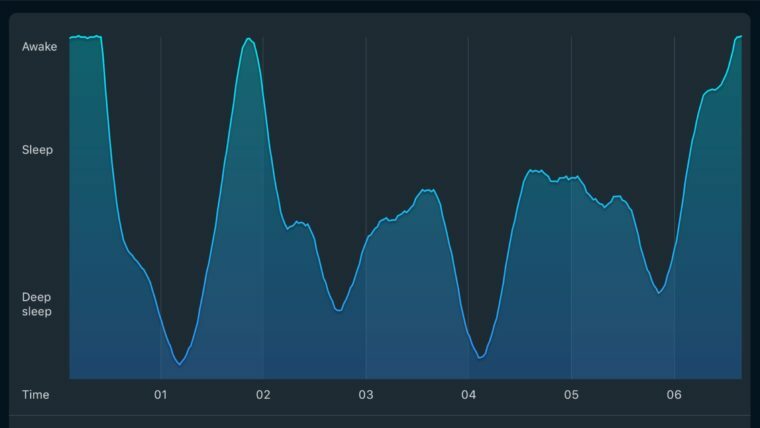 Sleep Cycle tracks your stats over weeks, months, and years. And while it doesn’t monitor sounds, it does detect motion, observe white noise, and include a heart rate monitor. The longer you use the app, the more you can understand about how real trends in both your internal and external environments (such as weather, stress, and hormonal shifts) alter sleep. Sleep Cycle’s alarm can also be adjusted to go off when your body is in a light sleep state. If you choose to nap, it’ll shift into a snooze pattern, playing your chosen wake-up song increasingly louder until it nudges you up. If you don’t want to go the full sleep app, but like the idea of a kind wake up, try Warmly or Gentle Alarm. Need help hitting the sack? The goal of Pzizz is to coach you to sleep or help induce a power nap. For more comprehensive info while you sleep and wake, MotionX 24/7 tracks sleep habits, but also monitors steps and heart rate, plus it integrates with Apple’s Health app so you can get a sense of how daily activity impacts your rest. For complete nighttime analysis, products like Sense also monitor the environment inside your bedroom (light, temperature, humidity, noise and air quality) and combine these results with your nocturnal movements, which are recorded by a sleep tracker that clips to your pillow. The collected data is synced to an app on your smartphone. All this sleep data is understandably pretty self-involved, but you can achieve a lot while you rest your head. The DreamLab app uses the power of your idle smartphone to help process the mountains of data around cancer research when you’re not using it at all. Simply download it, fall asleep, and you’re doing two great things at once; it’s as simple as closing your eyes. Alyssa works at the intersection of medicine and mobile technology. Partnering with the Garvan Institute, Hello Sunday Morning, and Baker IDI, Alyssa provides tech solutions to improve the health and wellbeing of Australians.